New Delhi: – In a major event which took place on 17th Dec 2016, Mr. Arvind Kejriwal Chief Minister of Delhi has informed media in a press meet that his washroom flush is not working & the files which were kept in that flush are also missing. These files were part of the investigation conducted by some seniors Delhi IPS officials & his party worker to unveil a big scam which took place during the year 2011-2014, when Congress was in power & BJP was in opposition and AAP was under maintenance. Find below the full Q&A between CM & Primetime news channel reporter Mr. Paplu Pandey. Exclusively for our readers. Reporter:- Why do you think that chaiwala was scanning files in CMO? Reporter:- Don’t you think flush size is small to keep a file of 2000 pages? CM:- “I knew that this scam will require lots of evidence and pages will just add up. Keeping this in mind, I have replaced CM’s office flush 4 months back with bigger tank & even bigger opening so that it is useful for both the jobs. The design has been done to ensure the toilet is kept CLEAN. After all I was an engineer and a clean India enthusiast. Reporter:- Why do u think it was someone from PMO, who took your file? Reporter: – Don’t you think it’s too soon to blame PM, Amit shah, when they were not even in the government during that tenure in Delhi or in India? Reporter:- Why don’t you allow police/CBI to do the inquiry? So after one on one discussion with Delhi CM, it’s evident that BJP is definitely hiding something big or we can say something is very fishy in the flush. We will wait for an exclusive reports from AAP office with CCTV footage. Catch us today on primetime with all the big spokesperson for today’s debate on -where the Fish (file) is “IN CMO or PMO Flush”. We have just seen Mr. Arvind kejriwal, Sanjay singh & Mr. Kumar Viswas talking about something. They seem tensed. After asking questions to the AAP’s official spokesperson Mr. Raghav . He said “Mr. Kejriwal is always tensed.He has such a huge burden of fighting corruption against Modi”. Reporter:- What did AAP official & his self-trained team Sherlock Holmes find. The man revealed us all this only after we threatened him with a live debate on primetime. So it can be safely concluded that in light of this confusion being cleared, it has been evidently proven that BJP is as clean as PMO’s toilet. P.S all views expressed in this post are for the sake of entertainment, please do not ask for our addresses and email ids. None shall be shared. We abide by all laws and park our cars in take off position wherever possible. 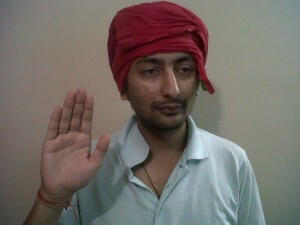 Yours truly’s housemate aka Vikas Agarwal. Ha ha ha…aggravating politics made light of! Rather enjoyed this piece Vikas! Have to laugh at these jokers in power, only way you can stay sane watching them carry out their ‘administration’! People in power or must I say Fools in power. But glad you brought this to light and glad that you took a funny tone as well. I will say never underestimate tge power of Chai walas ..